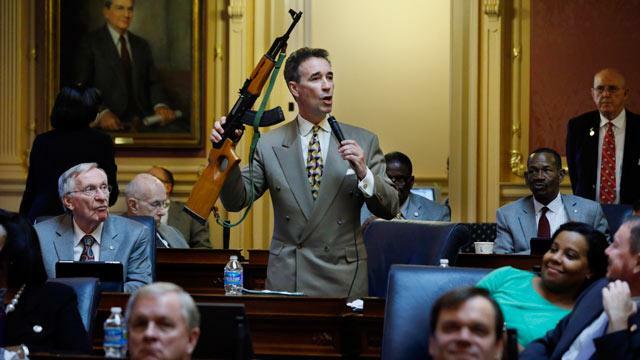 A Virginia state lawmaker brandished an AK-47 on the floor of the state House of Delegates Thursday. Virginia Del. Joe Morrissey, a Democrat hailing from the Richmond area, showed off the weapon while pushing for tighter gun-control laws, The Washington Examiner reported. "A lot of people don't know that in many locations in the commonwealth, you can take this gun, you can walk in the middle of Main Street loaded and not be in violation of the law," Morrissey said on the floor, according to the Examiner, assuring other lawmakers that the gun was not loaded. A subcommittee voted Thursday night to kill a bill Morrissey introduced that would have tightened gun controls in the state, The Roanoke Times reported. That bill would have banned the sale of so-called assault rifles and high-capacity magazines. Morrissey notified police and made sure the gun was not loaded, the lawmaker told ABC News in a phone interviwe. The point of the exercise, he said, was to show people the extremity of what's legal in Virginia, which scores 12 out of 100 possible points on state-by-state ratings of gun-control laws by the Brady Campaign to Prevent Gun Violence. Morrissey said his gun brandishing left at least some impression on his fellow lawmakers. "Some of my Republican colleagues came up to me today and said, 'I've heard of assault weapons, I had no idea what they're like,'" Morrissey said. "The clip I had in it was 30 rounds. Imagine a clip in three times this, imagine what you could do in a school." Morrissey got the gun from"some people I know who happen to be gun enthusiasts"-who support expanded background checks but disagree with his push to ban weapons like the AK-47. "I told them we would be using it for a demonstration," Morrissey said. "They see the point when I say, 'You can't fire a machine gun or a rocket launcher, so similarly, you may not like it, but I don't think you should be able to possess an assault rifle.' And while they don't agree with me on that point, we respectfully agree to disagree." Morrissey lamented Virginia's laws allowing guns in the statehouse. "As a delegate, I have the authority to bring guns into the chamber," Morrissey said. "Right now, there are members of the House of Delegates on the other side of the aisle that pack weapons." He assumes the guns are loaded, he said, and he doesn't like seeing them in the assembly chamber. "How about this," he asked, exasperated. "How about prohibiting firearms from coming into the General Assembly?"